So that's how Ryan stays so slim and trim! The snug sucked the salt from each pretzel. When she was done, she grabbed another pretzel. Sucking the salt must be genetic. I used to eat the "brickles" out of your dad's butter-brickle ice cream. Of course, that was *before* we got married and he still thought it was cute. . .haha. I'd guess she doesn't want the food off your plate because the food on your plate is GROSS. Get that kid some real munchies! I do think they're very cute, sharing a morning snack. Tess does the best impression of a "Halloween Spook" that I've ever seen! 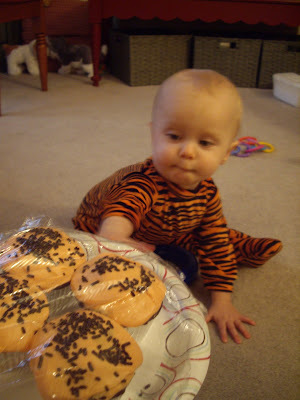 Happy Halloween little tiger Tess.